I couldn’t miss Hay Hay It’s Donna Day #6. I just couldn’t. It’s been near and dear to my heart since I started this blog. Despite everything that’s going on, I just couldn’t bear the thought of not being involved in this event. I had some trepidation, however, when I heard that JenJen over at I Love Milk and Cookies had chosen fritters as her Donna Day theme. You see, I’ve made fritters exactly one time, which was documented in this blog not too long ago. I think they’re a lot of work…getting your ingredients grated/riced/shaved/whathaveyou. I also think that fretting about the consistency of your batter isn’t worth the payoff in the end. Then there’s the actual frying. It’s all fun and games until you get a splatter of hot oil in your eye. I found this recipe, however, and was really curious to make it. I normally dislike carrots (I know..how random, right?) but this might be an interesting way to spin them. They were delicious! The green onions were a great foil to the sweetness of the carrot. In addition to the salt and pepper in the recipe, I threw in a few red chili flakes, some garlic, some ground ginger, and some cayenne pepper. I made a quick raita-esque sauce with yogurt, cucumber and cilantro. All of the flavors together were wonderful! These were great bite-sized as a snack…and would be a great accompaniment to chicken or pork with Indian spices in it. – In a bowl combine well the carrot, the scallion, the egg, the bread crumbs and salt & pepper to taste. In a large skillet, heat 1 inch of oil until it registers 375. In batches, drop the carrot batter mixture into the oil by tablespoons and fry the fritters until they are golden, around 1 1/2 to 2 minutes. Transfer the fritters to paper towels and let them drain. Serve as hors d’oeuvres or as a side dish. Makes 10 fritters. Awesome entry Tami. And a great effort considering how busy you have been. Thanks so much for making time. Glad you got your entry in, these look super! Yum! Those look tasty :) I missed another Donna Day…sigh, I am going to get my act together and join the next round! They look great Tami. Gorgeous olour. 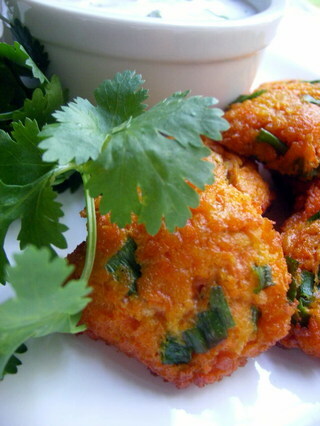 When my boys were little I used to make fritters with grated carrots and zucchini. It was the best method of getting them to eat their vegetables. I love this recipe – it’s so easy and yet can be flavoured in many different ways. While they’re incredibly good for you, I do think carrots can be a bit boring at times, so this is a good way to make them more interesting. Plus, you’re photos are great – the fritters are so . . . um, carrot-coloured! love your entry – so easy but yet so delicious! I love the simplicity of this recipe and of course the delicious factor!